There are pros and cons on using watering globes, like Aqua Globes, on houseplants. Do automatic houseplant watering globes, like Aqua Globes, really work? Those pretty glass plant watering globes do serve a purpose in plant care, but the advertisements can be misleading if you aren’t paying attention. Water globes claim that by filling the globe and inserting it into the soil, your plant will receive a trickle of water for up to two weeks. But, depending on the soil, the water may not last nearly that long, and using water globes requires periodic cleaning. Water Globes Keep Plants Watered for Weeks: You have to refill the globes every week or two. I don’t know about you, but given the choice between cleaning and refilling glass globes and simply pouring some water into my plants, I’ll probably choose to water the plants by hand. The watering globes are not designed to save time, but to moderate the water plants receive. It won’t take care of your plants on that month-long vacation, and it won’t remove “houseplant care” from your to-do list. Water Globes Keep Soil Moisture Constant: What the globes will do is administer a steady dose of water that is absorbed as your soil dries out. That means no more overflowing drainage trays or waterlogged plants. It also means that the rate of emptying depends on your soil – they may last two weeks in some soil and only a few days in different soil. Water Globes for Sensitive Plants: While many houseplants can simply be watered once a week or so, some plants seem to suffer if they dry out even for a day. If your plants wilt too easily, the watering systems can help. 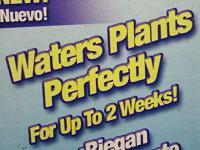 However, keep in mind that wilting may be a sign that your plant needs to be repotted. Cleaning Water Globes: The straw portion of the globe can easily clog with debris, and the inside can grow mold and algae over time. Cleaning the globes can be tricky – you may need a narrow pipe cleaner to clear the passageway. Keeping Water Globe from Clogging: To prevent clogs, make a hole in the soil with a pencil or knife before inserting the globe. Simply shoving the point into the soil can force soil into the opening – it can also break the globe and cut your hand! We answer selected questions right here on todayshomeowner.com. Thanks for your question! Are you just emailing the answers? You should post your answers to these questions so the rest of us can see. To clean mine when they get water deposit lines, I fill them with vinegar and some uncooked rice (for scrubbing action) and shake them for a while, or sometimes I let them soak upside down for a while first. How does one actually clean the globe? Currently the 2 globes hat I have work Perfectly. When clogged wih soil, I use skewers to rd it of the soil. Both plants have developed holes where he globes have constantly fond their home. I did this because I didn’t want to disturb the roots. Question: should heir placement be restricted or alters? Bought these for my indoor plants, surprised at how dry my poor plants were…I am refilling the spider plants daily. Checking the globes is easier than guessing without, love them! I will try Coke bottles outside. They dont last or clog up, but if you need a automatic plant water supply that feeds water to the plants for about 2 – 3 weeks and does not clog up its called a gravity cable. Ive purchased one on ebay and works great. Purchased two watering bulbs at thrift shop without instructions. Struggled filling them. I used a small funnel that fit into the stem opening but it took forever. Any suggestions on a quicker method? Thanks! I bought outdoor plant stakes. they fit a 2 liter soda bottle. Fill the bottle and twist on the stake. Turn it upside down, push it into the dirt and it waters the plant. I use them for my shrubs and bushes during the really hot dry weather. It uses less water than running the sprinkler and for me it saves time. My hydrangeas do very well with this watering system. Can I use the , watering globes, in a potted plant in the garden. .
Can somebody advise me about this. Can I use this for Cacti or no?? Yes, watering globes can definitely help keep your plants alive while you’re gone. Water each plant well first, then put full globes in each plant. Also, don’t turn your heat down too low while you’re out of town. We will be out of town for Christmas for nearly two weeks. I have a number of houseplants that I would like to at least survive until we get back. Do you think these would help keep the plants alive (even if they are not thriving) while we are gone? I have some water globes outside in some hot weather. Will the water, after it heats up, be bad for the plant? I’m sure the water gets quite hot so I’m a little concerned I’m not really helping my plant by having hot water being supplied to the root system. A little help? I use empty wine bottles instead. They’re much easier to fill, not to mention less expensive. Not quite as pretty, but my tomatoes don’t seem to mind! I think they’re brilliant and use them just for when we’re away on holiday! We use both the large and small ones depending on the size of container. Leave the soil moist and add the full globes the day you leave and two weeks later you still have a complete of living plants! I should put our experience in context though, we get approx 150 days of rain each year, rain being described as more than 1 mm (approx 0.4 of an inch). I want to fill my globe with rain water. what is the best way to do this? I have tried submersing it, a child’s medicine syringe, nothing worked, the hole is too small for a straw. I tried one yesterday and not sure what (if anything) I did wrong. The soil had been freshly watered so it was wet and I filled a globe with water and inserted it into the soil. Within an hour the globe was empty, to the point that water was spilling out of the under plate. I really don’t understand how this is suppose to work. How deep do the bulbs need to be in the pot? I pushed mine down pretty deep, does it matter? I would try baking soda and lemon juice. Just sprinkle some baking soda into the globe then add some lemon juice. Shake the globe about a bit to get some scrubbing action. What do I use to remove the mold/algae from inside the water globe? I tried vinegar and it didn’t work.